Protein Brownies possess nutritional greatness to match their awesome taste. Low in sugar, yet high in premium protein and fibre, they are the ideal snack to consume when the munchies strike. Protein Blend (30%) (Hydrolysed Whey Protein (Milk), Micellar Casein (Milk), Whey Protein Isolate (Emulsifier: Sunflower Lecithin) (Milk)), Fructo-Oligosaccharides, Humectant (Glycerine), Nibbed Hazelnuts (5%), Dietary Fibre (Inulin), Oat Flour, Rapeseed Oil, Fat-Reduced Cocoa Powder, Raw Indonesian Chocolate Couverture (Cold Pressed Cacao Beans, Coconut Sugar, Cold Pressed Cacao Butter), Natural Flavouring, Sweetener (Sucralose). Manufactured in a factory that handles eggs, soya, peanuts. Store in a cool, dry place and out of reach of children. 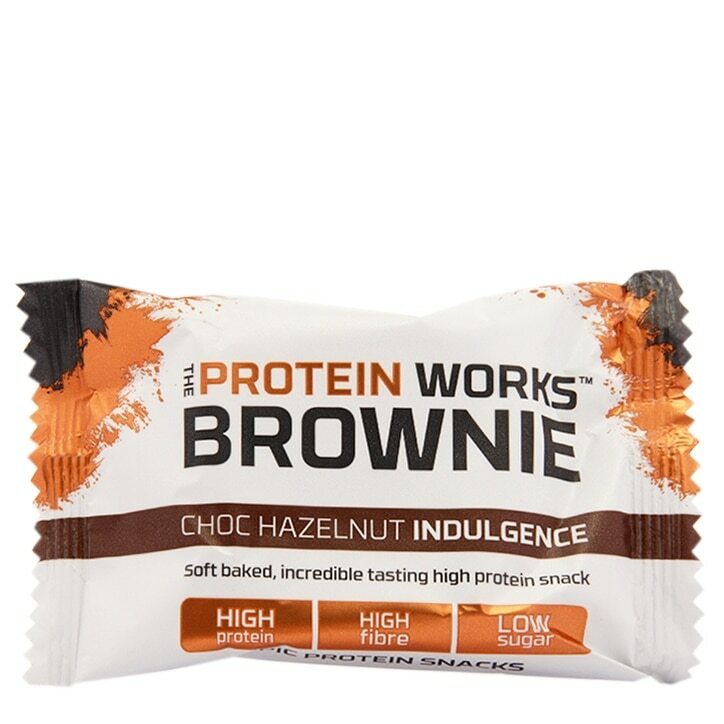 The Protein Works Brownie Choc Hazelnut Indulgence is rated 3.4 out of 5 by 5. Rated 1 out of 5 by jackie2721 from Sand would probably be tastier I bought 4...and threw them all away after 1 bite. Never in my whole life have I tasted something so awful. It taste like sand or cardboard and left my mouth so dry no amount of water could wash that horrible taste off. Rated 5 out of 5 by FT25 from Lovely I was a bit hesitate to buy this protein bar as I have tried others and it wasn't up to my expectation but this protein is absolute divine. Would definitely recommend to all chocolate lovers. Rated 1 out of 5 by Anonymous from Horrible Tastes awful, couldn't eat it it was so bad! Didn't expect to be so bad since the product is named "indulgent"
Rated 5 out of 5 by Budster from Tasty high protein chocolate nutty hit Really tasty protein hit. I've tried several protein bars but this has to be the most enjoyable. Moreish chocolate with small chunks of hazelnut throughout. Yum!! Rated 5 out of 5 by 2012inspired from Surprisingly good taste This has the right balance of protein and taste. It's not too chewy and goes well with an espresso after a heavy workout. It is rather small though so can only give 4 for value.